The carpal tunnel is a bony canal within the palm side of the wrist that allows for the passage of the median nerve to the hand. Carpal Tunnel Syndrome (CTS) is a pinching of the median nerve within the wrist. The carpal tunnel is a bony canal within the palm side of the wrist that allows for the passage of the median nerve to the hand. Carpal Tunnel Syndrome (CTS) is a pinching of the median nerve within the wrist. Pinching or compression of this nerve by the transverse carpal ligament sets into motion a progressively crippling disorder resulting in wrist pain, numbness and tingling in the hand. Pain is accompanied by a "pins and needles" feeling at night, weakness in grip and a lack of coordination. What can cause carpal tunnel syndrome? The most common cause of Carpal Tunnel Syndrome is inflammation of the tendons in the tunnel which can normally be attributed to repetitive use of the hand and/or wrist. Repetitive Stress Injuries (RSI) can happen to anyone whose work calls for long periods of steady hand movement, from musicians and dental hygienists to meat cutters and cashiers. RSIs tend to come with work that demands repeated grasping, turning and twisting: they are especially likely if the work requires repetitive vibration, as in hammering nails or operating a power tool. Stressful hand, arm and neck positions - whether from working at a desk, long-distance driving or waiting on tables - only aggravate the potential for damage. A number of sports can bring on Repetitive Stress Injuries. The obvious sports associated with these ailments include both Tennis Elbow as well as Golfers Elbow. Just about any activity that involves repetitive movement, including rowing, skiing, archery, etc. can lead to injury. Causes of carpal tunnel syndrome and repetitive stress injuries? Repetitive use of hand/wrist. Long periods of steady hand movement. Repeated vibration. Repeated grasping, turning, twisting. According to the Wall Street Journal, the Occupational Safety and Health Administration (OSHA) reports 60% of workplace health disorders involve repetitive motion. What can be done to relieve symptoms of carpal tunnel syndrome? Various braces, straps, creams, arm supports, and medications etc. have been employed to alleviate pain caused by Repetitive Stress Injuries. Some are too bulky to wear for any length of time, some cause intractable side effects of their own, while others simply do not work. Tenex® Elbow Shock Absorber (SA) has been clinically proven to eliminate the damaging vibrations that cause fatigue, muscle stress, joint injuries and Carpal Tunnel Syndrome. Double blind testing undertaken by independent researchers has shown that Tenex® ESA reduces shocks and vibrations to the arm by 50 - 70%. Tenex® SA will reduce downtime on the job due to work-related repetitive stress injuries. It is very effective for workers who are exposed to constant, and often unsuspected, damage caused by repetitive motion from the use of impact and vibrational tools. It alleviates the stress inflicted to arms and joints from repetitive pounding and tapping. 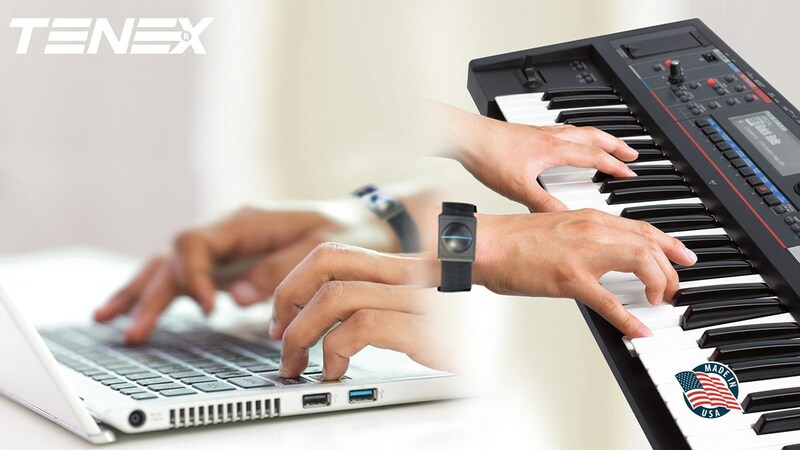 Even minute impacts from the repeated motion of keyboarding may be combatted with Tenex® ESA - the best small shock absorber on the market! Tenex® Elbow Shock Absorber utilizes a high density liquid formula designed to absorb vibration at the wrist before it can travel to the sensitive tendons of the carpal tunnel. 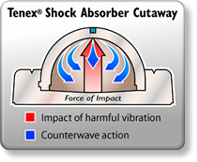 When TENEX® Elbow Shock Absorber is subjected to impacts (even minute) from repeated shocks and vibrations, it creates a continuous counterwave action inside the spherical module which neutralizes the force of impact and any resulting harmful effects to the tendons. How is Tenex® Elbow Shock Absorber Worn? Lightweight, elegant and comfortable Tenex® Elbow Shock Absorber features an adjustable, self-gripping, wrist band with a soft, breathable backing. Worn just above the wrist bone, Tenex® Elbow Shock Absorber fits snugly and comfortably. Do not overtighten. 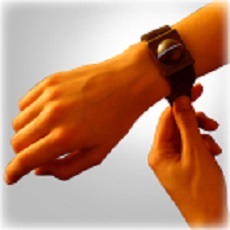 You may want to adjust the band for comfort after a brief period of wear. The strap can be removed and washed; then, simply re-inserted into the Tenex® module. How Does Tenex® Elbow Shock Absorber Compare with Other Products? 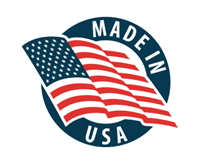 Other products rely on different types of technology for effectiveness. Air braces, cream pain relievers, elbow bands and wraps, gels, hot & cold therapy, magnetic products, patches and neoprene sleeves are all used to treat stress injuries with effectiveness rates between 0 to 7%. Studies show that Tenex® Elbow Shock Absorber reduces damaging vibrations by 50 to 70% - far more effective than its nearest competitors. 25 Years in the business of helping people with tennis elbow, carpal tunnel, golfers elbow. Since 1989 Tenex® Corp. has achieved excellence in the prevention and treatment of tennis elbow, golfers elbow and carpal tunnel syndrome. I have ordered before and now getting one for another friend with golfers elbow...I had rotator cuff surgery and this has been wonderful!! We are always here to help. Please contact us.